It is week 8 for us over here at the Chicago Semester Program and let me tell you… the time has FLOWN by! Last week I completed midterm evaluations with my cooperating teacher and my professor. Midterm. Evaluations. I made this joke last week during seminar, but I’m nervous it is truer than I’d like it to be: before we know it, we are going to blink, and it will be Christmas Break. Someone please tell me how to slow down time! My semester in Chicago has been more than I could have imagined. One thing that makes me excited for these last few weeks here in Chicago is the fact that I no longer have to worry about my edTPA! For those of you who do not know, the edTPA is part of the teacher certification process in Illinois. We have to create a mini-unit, teach it to our students, videotape ourselves, and write 3 massive commentaries that dissect every decision we made while planning, executing, and assessing our unit. It was a doozy, but I made it through! I submitted my edTPA for assessment and now all I have to do is play the waiting game. The professors at the Chicago Semester program supported us as much as they were allowed to during this process, and I must say they were very helpful. I was the only one in my cohort who didn’t have training in the edTPA process prior to this semester. It’s all out of my hands now, but I feel confident in the hard work I put into my edTPA. 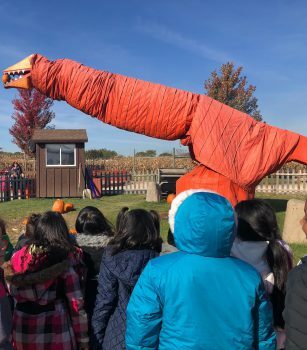 One fun fall festivity that my class has already taken part in was a field trip to a pumpkin patch. 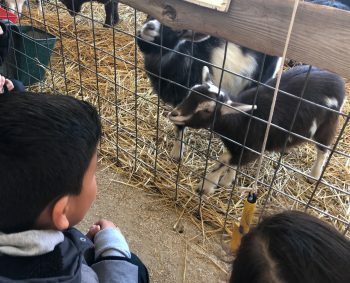 Last Wednesday, we loaded up on a bus with the other second grade students and we drove 45 minutes to Goebbert’s Farm. While we were there, my students got to see farm animals, ride a hay wagon, and pick out their very own pumpkin. This field trip was especially exciting for us because we recently learned about the country. During the entire field trip, I kept hearing, “Miss. Courtney, Miss. Courtney!!! We are in the country because……” The explanations were endless; I must admit that this was a proud teacher moment in my book! While I’ve been in Chicago, it has been fun for me to figure out the free activities in which I can participate! Grand Rapids is where Calvin College is located, and they are pretty great at having free events for their residents. Unfortunately, the free events in Chicago are less bountiful, but they are amazing when you find them! This weekend we went out to explore the Magnificent Mile and the Lincoln Park Zoo. There are two zoos in Chicago (Lincoln Park and Brookfield) and lucky for us – the Lincoln Park Zoo is a free zoo! I’ve been trying to take advantage of the fall weather before it gets too cold, so this adventure over the weekend was much needed. Can I also add that the zoo was having some sort of Halloween day? There were so many cute kiddos in creative costumes. Later on this week I will be attending a Chicago Symphony Orchestra concert with the Chicago Semester students! I’ve been to the CSO multiple times growing up, and I remember a time where I wished I could be the principal percussionist. There are so many fun things to do in Chicago and I’m so glad that they are right at my fingertips.